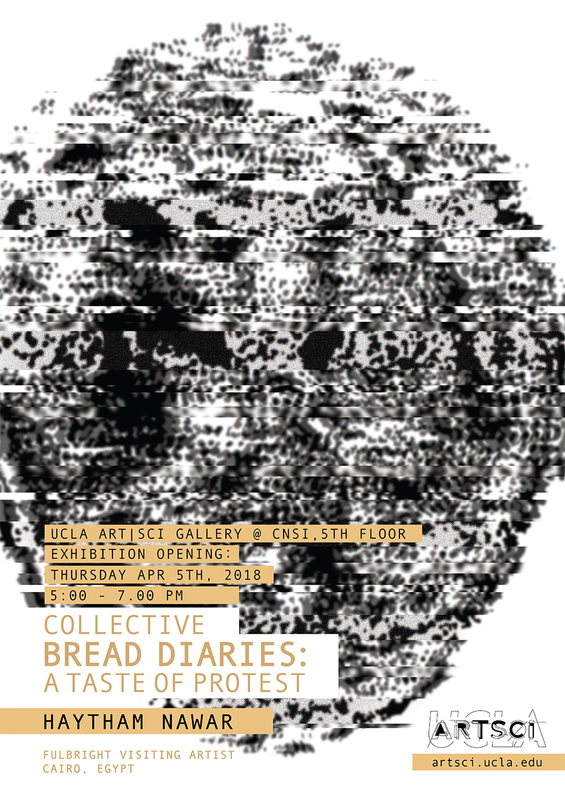 Drawing on the commonly unnoticed value of bread, and the everlasting impregnable imprint it has always had on revolutions throughout history, Collective Bread Diaries: A Taste of Protest is an interactive art project in which participants are granted the opportunity to draw and share their personal visual representations of bread, eventually forming an array of visual diaries, each peculiar to its creator. The results are exceptionally reproduced by a machine, which although possesses no threads to culture, tradition, or history, emphasizes the conscious perception of one’s distinct identity. UCLA Art | Sci Center Artist In Residence and Fulbright Scholar Haytham Nawar is an artist, designer, and researcher who currently lives and works in Cairo. He is Assistant Professor and Director of the Graphic Design program, Department of the Arts at the American University in Cairo. He is the founder and director of the Cairotronica, Cairo Electronic, and New Media Arts Festival.